Sample received for review purposes. All opinions are my own. When it comes to strollers there are so many out there to choose from it can make your head spin. From different styles to what seems like endless possibilities in options. 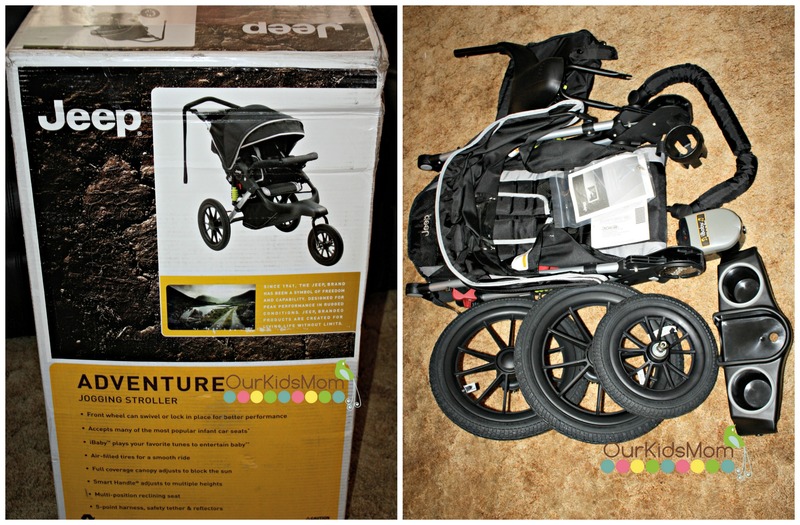 I was sent a Jeep Adventure Jogging Stroller to review, and I couldn’t wait to try it out. The options on this stroller had everything I was looking for and more. There is some assemble require when you purchase this stroller, it took me about 10 min to assemble and I didn’t have any issue when doing so. This stroller has shocks! You can see them moving as they are working while they keep your child’s ride as smooth as possible. There are built in car seat straps that I love because you can fit pretty much any infant car seat on this stroller without having to have a special adapter. 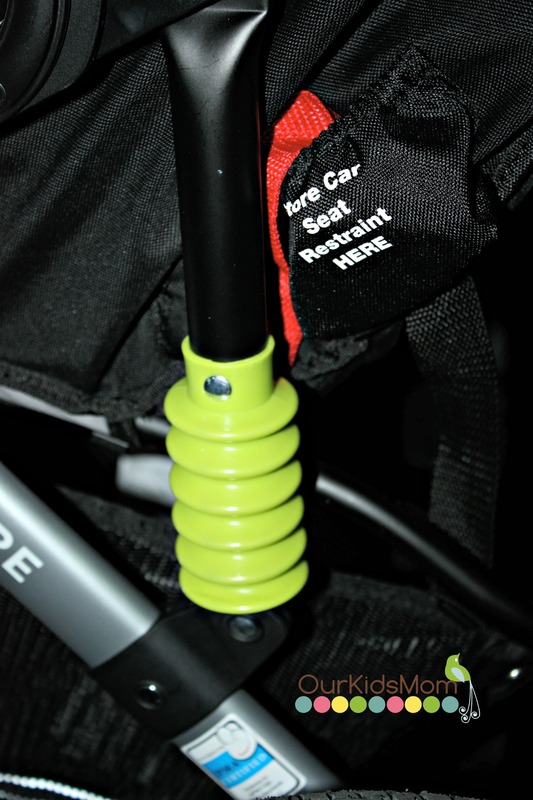 There are pockets on each side of the stroller to store the straps when not in use. The brake system is a one touch foot brake that is fast and easy to use when needed. The rear wheels are 16 inch air-filled tires for comfort and performance on uneven surfaces. The front tire has a locking option for while joggling, or you can let is swivel during everyday use for easy turning. One of my favorite features of this stroller is the multiple heights you can adjust the handle to. I’m fairly tall and there is nothing worse then having to bend over to push the stroller because the handle is too short. Now I also have a 3 year old little mommy who likes to help push her baby brother around and with the easy push buttons I can adjust the handle down to the lowest setting and she can easily push the stroller all by herself! There is a great large size storage basket underneath for those extras that have to come with when your out and about with your baby. You can access the basket from the front or the back, which comes in handy. One thing with the front access that I have noticed is when I have a blanket on my son and he kicks it off it doesn’t fall on the ground, it actually slides down into the basket. This also happens with his toys that fall down in front… they also end up in the basket (fabulous!). Just one of those simple things that I LOVE. A unique feature that stood out to me on the Jeep Adventure Jogging Stroller is the iBaby sound system that allows you to connect your iPod, iPhone or MP3 player to enjoy your music while your out for your run (or walk :). This is a great bonus. The speaker isn’t particularly loud, (about the same level as my iPhone 4s) but I can keep my device safe in it’s compartment without fear of it falling off when I hit a bump. On either side of the sound system are nice sized cup holders for your water bottle or coffee mug. There is also a cup holder for your baby to use up front, which my older kids enjoy. On the sides of the stroller seat are some added mesh pockets for you to place your phone, keys, or your child to use for toys. 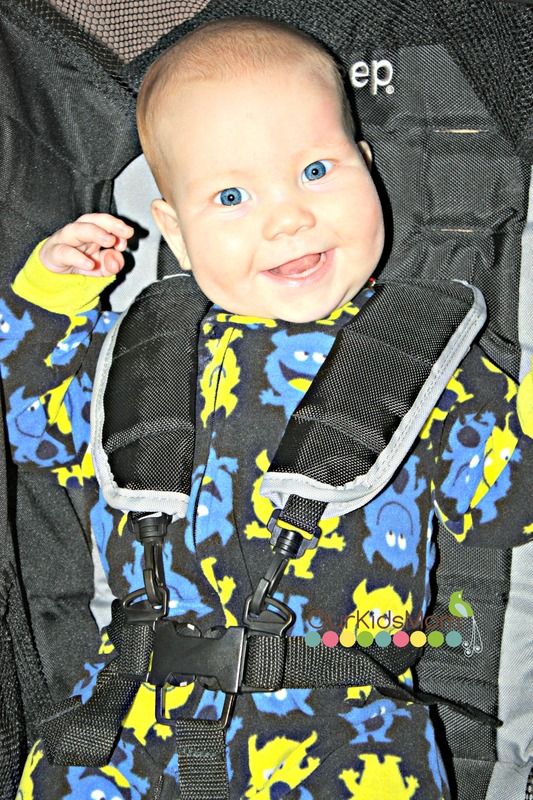 Your child rides safe and secure in this stroller with the 5 point harness. My 6 month old is starting to sit up with some assistance now. I can place him in this stroller and have peace of mind that it will hold him securely in there while he’s sitting up. The seat can be reclined to multiple positions with ease for those times when your baby falls asleep and you need to recline them. The stroller folds up easily by pulling back on the release tabs. The rear wheels have a quick release for extra compactness. I find this stroller isn’t a super compact stroller compared to an ultralight, but comparing it against other joggers it folds down quite well. This stroller has a little weight to it at 31.5 lbs but it has a huge weight capacity of 60 lbs! My almost 6 year old is 43lbs and can ride in the stroller… amazing! 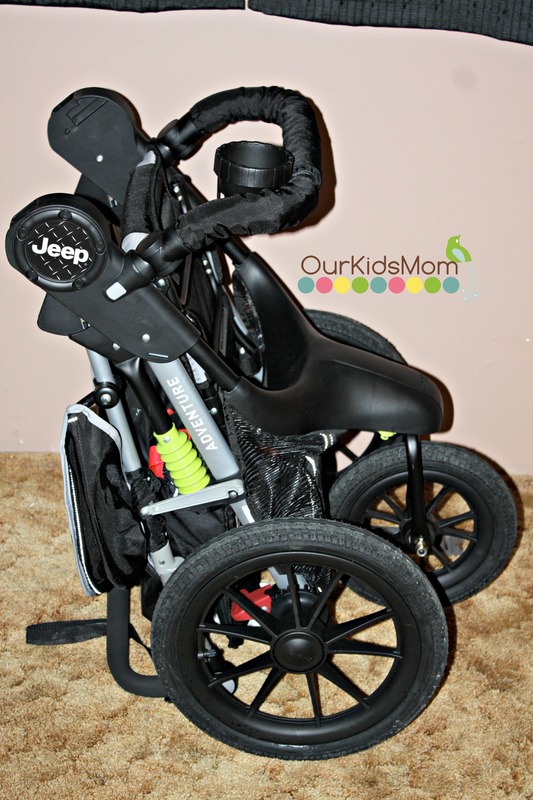 The Jeep Adventure Jogging Stroller is built well and so sturdy that even with my oldest in the stroller there is no wobble or funny play while pushing. It feels just as though I’m pushing my 6 month. The canopy is a super large canopy to give your child great shade while out in the sun. There is a nice large peek through window in the top of the canopy so you can keep a constant eye on them. I would have liked to see a cover for the peek through window, though, as the light does shine through and can’t be blocked unless you place something over it. 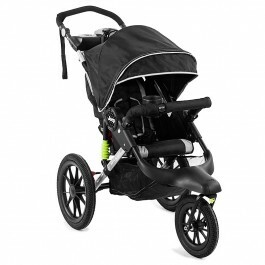 This is a great jogging stroller with everything I like in a stroller and then some. You can purchase the Jeep Adventure Jogging Stroller at www.kolcraft.com for $349.99. It is worth every penny… you are getting a stroller that will last. I’m sure, in my case, that it’ll last through multiple kids. It will take you everywhere and anywhere you might want to go in life with a child. Kolcraft believes in giving back to the community. They have found that silent auctions not only benefit moms and children in disadvantaged situations, but they give the winner a great product at a fraction of the retail cost. 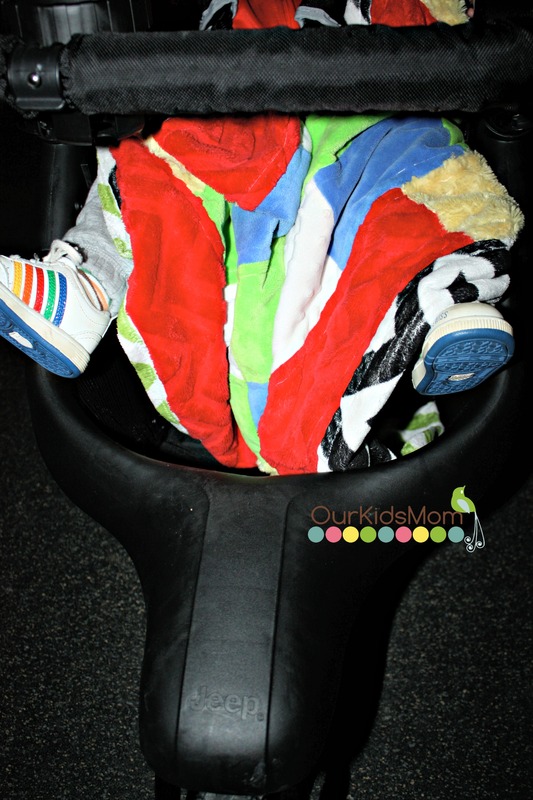 Because of this, Kolcraft is offering a Jeep Adventure Jogging Stroller for this auction! Beginning bid starts at $20 with subsequent bids increments of at least $5 (bids are placed in the comments section of the blog). At the end of the auction, whoever has the highest bid wins. The winner will make their donation within 48 hours to K.I.D.S. : Kids In Distressed Situations and provide a copy of the electronic receipt. If the winner fails to respond or make their donation within 48 hours, the bidder with the next highest bid will be declared the winner. After receiving the donation receipt Kolcraft will then send the winner a Jeep Adventure Jogging Stroller! Thank you for your bid Heather! The current high bid is now $50. I will bid $25… Looks awesome! Thank you for your bid Carla! The current high bid is now $50. I bid $55, looks like a cool stroller! Is there shipping on top of the bid amount? I’ll bid it to $80 please!!! Congratulations Carla and THANK YOU to everyone that participated!!! K.I.D.S. is a great cause and I love helping Kolcraft support them!